Seasons Greetings from Jeff Lange! Celebrate the holidays with this all-new DVD featuring magical experiences from the “Merriest Place on Earth”, Disneyland! Sleeping Beauty’s beautiful snow covered castle. Sleeping Beauty’s Winter Castle Lighting – Experience Disneyland’s winter castle in all of it’s holiday majesty! This park icon, decorated with snowdrifts and icicles, transforms like magic as it sparkles and glistens while snow falls all around you! “it’s a small world” holiday – Watch as the exterior facade of Disneyland’s “it’s a small world” attraction magically comes to life in an amazing display of holiday images and music! Next, board your boat and enjoy the “happiest holiday cruise that ever sailed” in this tribute to children the world over! “Believe…In Holiday Magic” Fireworks – This fireworks spectacular lights up the skies over the Magic Kingdom and Sleeping Beauty’s castle. The show is a combination of five acts: The Magic of Christmas, Christmas Merriment, A Heartfelt Holiday, Holiday Wonders and The Spirit of Christmas. Your night concludes with a magical snowfall on Main Street USA. 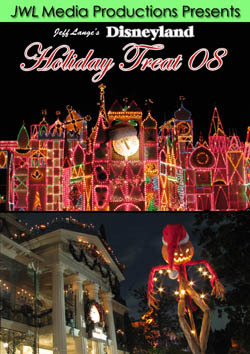 Pick up a copy of “Jeff Lange’s Disneyland Holiday Treat 08” today and relive all the holiday magic or experience it for the first time.